Beading Arts: Bead Soup reveal day! I wish I had known about the Bead Soup Party that Lori Anderson hosts before! That said, I am so glad that I learned about it this year, doubly glad I decided to do it, and triply glad that Chris Murphy was assigned as my partner! For those of you who don't know Chris, you should! She won second place in the 3rd Use the Muse contest for a gorgeous piece called Butterfly Net. Take a look at it...how clever is that? Chris sent a box full of beads that I might never have known existed otherwise. She introduced me to the most enchanting blue-green fire agate, to lovely carved horn beads, and to copper beads that I still can't believe actually exist! I hope this first piece that I've made using her treasures will make her proud! 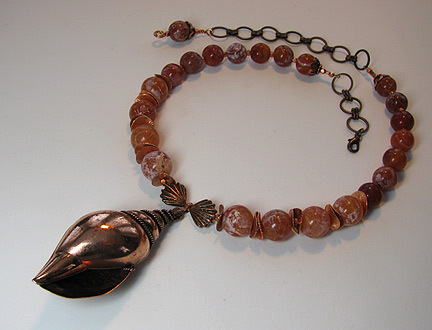 The second piece that I made from Chris's stash features the fabulous copper seashell. There was simply no way that a focal like that could sit around unused on my work table for too long! Here is the complete list of all the folks involved in the Bead Soup Party this time. I hope you'll have time to visit many of them...we are all revealing our pieces today! 29. Cyndi Lavin, Beading Arts You Are Here! 159. Christa Murphy, Adventures of One Beady Woman My Fabulous Partner! Both pieces are just elegant. It's like the beads were made for each other! Wow Cyndi, they are both very stunning. If I had to pick one, it would be the first one with the curved copper and carved bone beads. Absolutely beautiful! Have a great weekend. Gorgeous designs to compliment those Gorgeous Beads!!!! You just introduced me to that blue agate - fantastic color - beautiful soup!!! as always, you rule!!! you make wonderful things!!! great materials too. :) xoxox Cyndi! Love your pieces :-) I'll be back again. WOW! I love it - amazing! I love the first one, too! The first piece takes me to Nepal, and I really covet that copper shell. Nice! Both pieces are fantastic. I bet Chris is very proud ;) I love those little discs you used as spacers. I got some in my soup last year and have kept my eye out for more ever since! WOW! Both pieces are simply incredible!! I don't feel worthy! lol You are an awesome designer! WOW you were a lucky girl weren't you! Beautiful work! You were too kind with your comments about me. You sure made me proud of the beads I sent you. I love both pieces although I love the first one the best. I can't wait to see what you do with the cabs. Oh wow, that first piece really makes me drool. Can't wait to see how you made that. And that copper shell. . .wowie!! Oh my goodness - this is some serious artwork! These look like the y belong in a museum....just gorgeous. Truly gorgeous! Can't wait to see what you do with the bonus pieces! Such a Rich and timeless pc the top necklace. Its just Stunning! Can Soup be stunning ach well its HOT and wonderful!! Wow! Those copper beads are amazing. I don't know about Chris but I love how the necklace turned out. Great soup! Gorgeous pieces! I love all the copper and the agate. All I can say is LOVE! Beautiful. I am in love with your first piece! It is a-ma-zing! Gorgeous pieces! Love your work! They make me want to say that they are both "Bally" Good! They stike me as having a India influence to them....Gorgeous pieces!!! WOW!!! you definitely had some wonderful soup to work with! I love both necklaces, but that copper sea shell is to die for, love it! 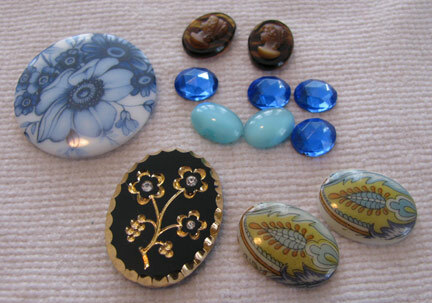 Great pieces :) I look forward to seeing what you do with those cabs! I love both your pieces, interesting and inspiring soup. I love both pieces of bead soup! You did a wonderful job! I'll be looking forward to your tutorial! both pieces are wonderful, I'd wear them both! Very elegant pieces love that copper shell bracelet. The beads you used really show case the shell. Great job. They are both nice, but that copper seashell in that 2nd piece is out of this world. Really nice. such a beautiful mix to work with and you did everything great justice...the finished pieces are beautiful! Goodness what wonderful beads, you certainly made lovely necklaces with them, I would love to come back and see what you do with the cabs. Oh, wow, both pieces are absolutely stunning! Wow, great work, especially love the first necklace! Wow, both pieces are stunning. I'll look forward to your tutorial. Wow! you did a wonderful job w/ the beads! and what lovely cabs you got! WOW but that first necklace knocked my socks off! All of them are beautiful but I want to snag that first one! I want to kiss that first necklace on the mouth! LOVE it! 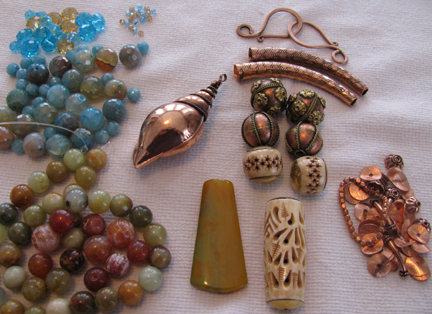 Lovely pieces - I love what you did with the shell copper bead. Simply fabulous -- both pieces are fantastic!! I love this copper sea shell. Your designs are both really nice. The carved beads are wonderful and this necklace is absolutely fantastic. The seashell necklace is equally awesome. Great Bead soup. Beautiful pieces, I love the first one it makes my heart sing. Wow! Your first piece is my favorite that I've seen so far. Awesome components and design. Glad to be in this group with you! Gorgeous designs!!! You did an outstanding job with your bead soup! WOW! Both pieces are awesome! I love all the copper! Wow- you did wonderful work with the way you created something perfect for the beads you were given. Oh wow, Cyndi, your first piece is really stunning!! Nice job. Your first piece has a very exotic feel and I really like the conch shell. Both designs are fabulous. I have to say that both of your necklaces turned out fantastic. I would love to have those in my jewerly box. You did a fabulous job with your soup. What a great set of beads to work with and you did them proud. Great job. That first piece looks like some tribal artifact that I'd see behind glass in a museum! Very impressive!!! What beautiful pieces they both are. Really played up the beads and coppery colors. The second piece is awesome love it! Wow what beautiful pieces. I really loved the first piece the most but gee that shell in the second is just stunning so I will say that I love them both! Well done! Ooh, I especially love the second necklace! Just in time for summer! The first necklace is my absolute favorite! I love all of the copper together with the bone :) Soooo pretty! oh I so want them! Both! I want to wear them. Both. Those are both really pretty.. I like the colours in the first one a lot! I love them both and am seriously coveting the first piece. Gorgeous! Oh Cyndi, those are both gorgeous pieces! I really love what you did with the first piece. I would so be wearing that...A LOT! Awesome job lady! Awesome soup. Really love that shell. The best part of these hops is making new friends. And a generous one too! I adore the first necklace. It is so powerful, almost spiritual, like a talisman to ward off evil. I love it. That carved tube is so awesome. Thanks for sharing. Love what you made with your soup. 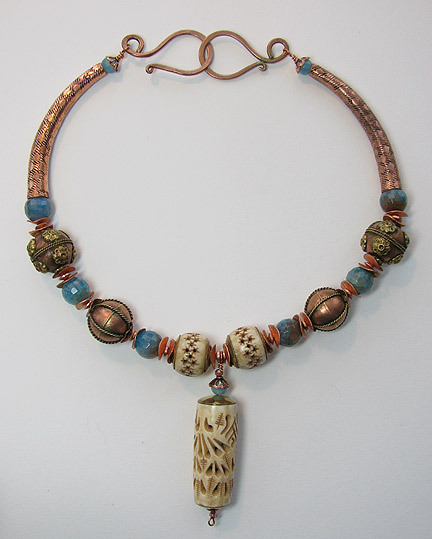 The 1st necklace is awesome, the copper the use of your beads. Love the design. Beautiful necklaces! I especially love the second one for its rich colours. Yum! Wow, all that copper is simply gorgeous! I love the copper beads in the top piece especially. Wow! Love the design of the first one... but that copper shell is irresistable! Very pretty pieces! Holy cow, this Bead Soup thing is huge! I had no idea. I hope we will get to see what happens to the beads you threw into the soup, Cyndi. The pieces you've made with your "soup package" are wonderful! Wow! Gorgeous! Stunning! Love all creations! What a stash you got! Thank you so much for stopping by my blog and leaving a comment. So nice of you! Just beautiful perfectly balanced pieces. I like it that you made shorter necklaces while so many of us were making long creations. Your two are outstanding. The necklaces are wonderful...love the first one. Oh, how I love that first necklace. I mean LOOOOOOOOOVE it! Favourite.